Imaginative and highly ambitious regeneration project which turned a redundant quarry into an immensely successful visitor attraction of national and international stature. Gaining the support of, and involving, local people throughout has been a key aspect of the project’s success. 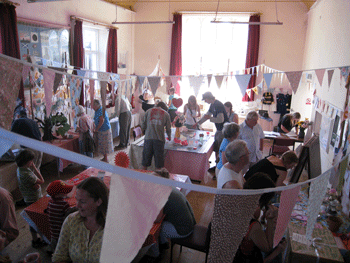 Events, workshops, meetings, open house events, exhibitions. Formation of organizations or partnerships, launch of initiatives, project completion. 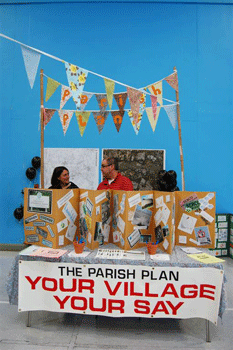 Local election, local plan adoption, tendering. Restoration of overgrown gardens at Heligan, Cornwall, begins. 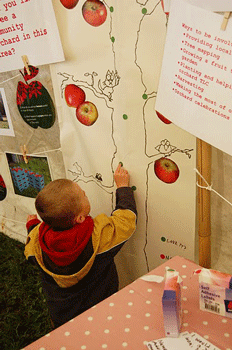 Developed by a group of those involved with Heligan led by Tim Smit and Jonathan Ball. Aim to build the world’s biggest greenhouse to tell the story of the interdependency of plants and people. Believed that a landmark, iconic structure – recognizable around the world – would bring many people to Cornwall just to see it. Engaging with the local media. Presentations to interested parties around the county. Targeting key opinion-formers and decision-makers. Exploring collaboration with educational institutions. Building a new access road was key to planning permission. This took two years and caused more difference of opinion than the project itself. Bodelva china clay quarry. An irregularly-shaped, 22 hectare hole of 30 – 70 metres depth. Public able to view construction creating a sense of public anticipation and ownership – especially among the locals. Year-round opening, even though Cornwall primarily a summer tourist destination, the project has helped to extend the tourism season from February to November. Preference given to Cornish schools when booking schools visitEngaging local schools in international programmes such as Gardens for Life, while providing support for teachers. Entry deals for local people. During the 20th century, Cornwall experienced the protracted contraction of its traditional primary industries – fishing, agriculture and mining. This has left a legacy of 4,000 hectares derelict land, run-down, inland communities and a unique cultural landscape heritage of old mine sites, associated agricultural landscapes and the country garden estates created with mining finance, manifested today as a characteristic garden heritage. 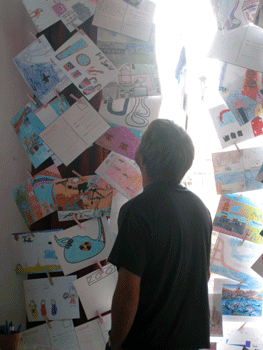 The power of emotional engagement through art-led interpretation. 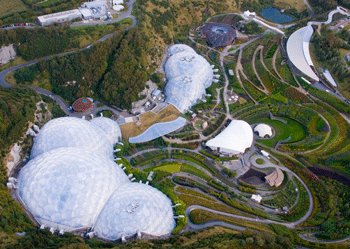 A Vision for Eden eventually developed into creating a showcase of humanity’s role in the natural world, taking a positive perspective, and gently encouraging visitors – ultimately as part of the solution - simply to care. It provides a beneficial microclimate for plants. It allows almost complete concealment of the site from the surrounding land – almost invisible until the visitor makes an entrance into the dramatic landscape on exiting the Visitor Centre. Become a symbol for the environment movement as a ‘can-do’ icon. Innovation. Innovation permeates the organization’s civil engineering, construction, materials sourcing, waste management, employment policy, management structure, external relations, educational programmes, public learning and interpretation, plant health, nutrition and soils, horticultural and exhibit design and more. Eden has proved that with some imagination and determination people can produce an enormous positive force for change. Eden would not have happened without significant local community support, both from the county and from the site’s immediate neighbours. Crucially, the project symbolizes what can be achieved by delivering an ambitious vision borne of local circumstances. The project has developed as a major force in Cornwall, not simply in economic terms, but in the creative, enterprising approach it brings to waste management issues, transport, education, horticulture and accessibility issues. 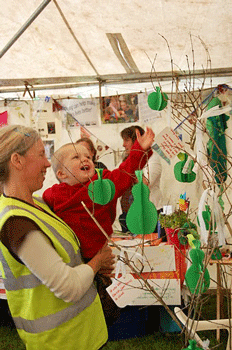 Make education fun and engage visitors emotionally. It would not have been possible to construct Eden and, critically, maintain its educational and regeneration ethos without the huge injection of public funds. 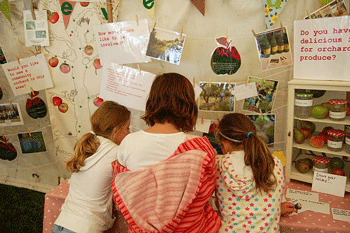 As Eden has grown so has the organisation’s outreach work. It works with a wide range of groups and individuals, building capacity through volunteering opportunities, creative workshops, formal education and community engagement events. 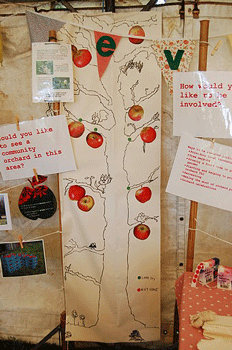 The latter includes small projects such as establishing community orchards to large scale developments like St Austell Ecotown. Eden: The Inside Story and The Gardening of Eden. "Eden would not have happened without significant local community support, meaning support from the county as a whole and from the immediate neighbours." "The preview opening of Eden’s Visitor Centre, in May 2000, was key to nurturing a sense of ownership in the county, and fuelled a developing sense of anticipation nationally, particularly through the media." "Eden provides an excellent example for the re-use of a brownfield site for a major transformational regeneration project. A china clay pit was chosen to show that people can have a positive impact on their surroundings – hopefully inspiring them into action in their own lives – as an antidote to the constant and consistent bombardment of environmental doom and gloom purveyed daily by the mass media. The regeneration lessons learned from Eden are applicable to anyone or any community or organization, as well as to the mining sector in general." Thanks: Based on a case study by Pete Whitbread-Abrutat for The Post-Mining Alliance, 2006/7. Editing by Juliet Rose, Mike Petty and Nick Wates. This case study funded by Building Community.